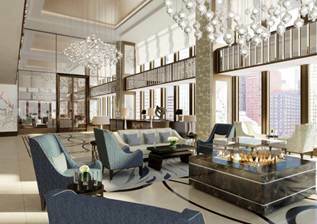 The Langham has unveiled its newest and most highly anticipated property in its heritage brand, The Langham, Chicago. With the opening of this purpose-built hotel, Langham Hospitality Group (LHG) officially has a third example of its marquee brand, The Langham, in the United States. Based on the notion of classic European hospitality exemplified by the original hotel of the same name, The Langham, London, this luxury property proudly boasts an address within one of the United States’ most famous architectural landmarks. Located at 330 North Wabash Avenue, The Langham Chicago is housed within the former IBM Tower designed by Ludwig Mies van der Rohe, which was declared a Chicago Landmark in 2008 and entered into the National Register of Historic Places in March 2010, thereby continuing LHG’s legacy of owning and managing properties with historic and cultural significance. As a testament to this heritage, Mies’ own grandson, interior designer Dirk Lohan, designed the Entry Lobby at ground level, incorporating furniture and objets d’art from his family’s personal collection. The hotel’s 316-rooms, starting at 516 square feet, will be among the largest in the city and many will feature views over the Chicago River. These views extend to the Pavilion Lounge, which will be the setting for the Langham brand signature of Afternoon Tea. Travelle, the property’s signature restaurant and bar was designed by David Rockwell of the Rockwell Group and will feature a glass expo kitchen and Chef’s Table, all overseen by Chef Tim Graham, formerly of Tru. 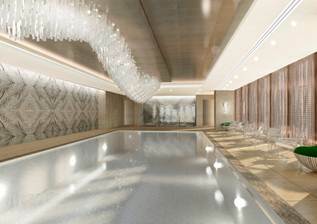 The group’s award-winning 22,000 square feet wellness retreat which includes its signature Chuan Spa will offer a new and innovative spa experience with treatments based on the principles of Traditional Chinese Medicine. And the hotel’s art collection, overseen by curator Lauren Rottet, will include sculpture, photography and paintings by international artists as well as artists plucked straight from the burgeoning Chicago art community.